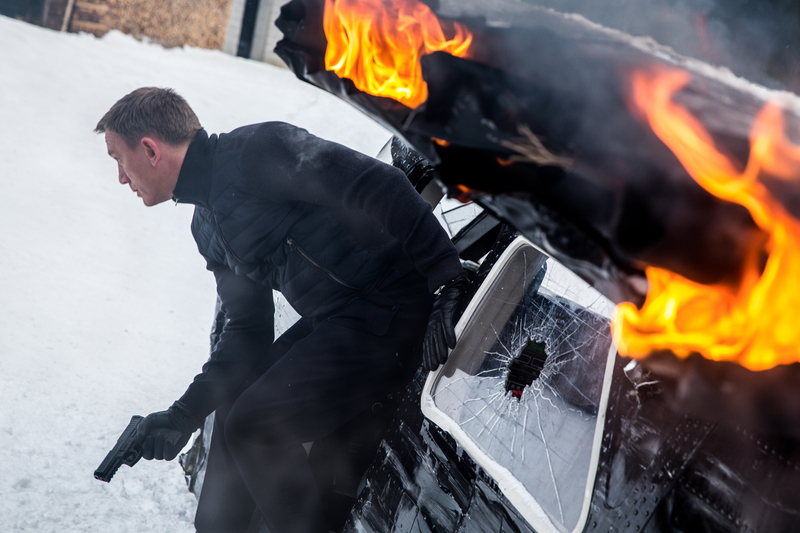 Bond (Daniel Craig) leaping from the sliding damaged plane gun drawn; Obertilliach, Austria in Metro-Goldwyn-Mayer Pictures/Columbia Pictures/EON Productions’ action adventure SPECTRE. ©MGM Studios, Danjaq LLC and Columbia Pictures. CR: Jonathan Olley. 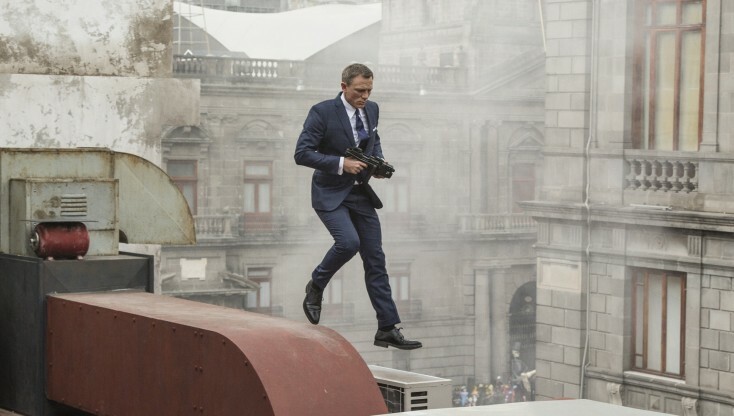 Nobody did it better than actor Daniel Craig, director Sam Mendes and screenwriters John Logan, Neal Purvis and Robert Wade with 2012’s “Skyfall,” a strong contender for the best James Bond film ever made. That same team (plus writer Jez Butterworth) fails to reach those heights with this fun but frustrating follow-up, which makes so many nods to the franchise’s fabled history that it sometimes feels like a fan-fiction nostalgia fest. There’s a frantic “From Russia With Love”-like fight in a train car, an “On Her Majesty’s Secret Service”-style Alpine mountaintop clinic, a “Casino Royale” collapsing-building deathtrap do-over, and a pre-credits helicopter-peril scene a la “For Your Eyes Only” (although thankfully without a delicatessen reference). A bigger mistake is that “Spectre” attempts to tie all of the Craig 007 outings together by maintaining that the arch-villains of “Casino Royale,” “Quantum of Solace” and “Skyfall” actually were working for the global terrorist organization Spectre, headed by the amiably snide Franz Oberhauser (Christoph Waltz), who has a psychotic but very personal stake in wanting Bond dead. This retroactive-continuity gimmick not only trivializes the bad guys from the earlier films, who definitely did not come across as mere “regional manager” types, but implies that Oberhauser has a ridiculous amount of patience when it comes to disposing of Bond. Similarly, it’s a mystery why the former M (Judi Dench) never bothered assigning Bond to take down Spectre while she was alive, instead of waiting to put him on the hunt via a cryptic recording delivered to him after her death. Two moments in the movie that ring very false occur when Craig’s gritty version of Bond should have taken kill shots to make sure that certain antagonists wouldn’t pop up to give him more trouble later. One of those lapses is chalked up to the same unlikely sentimentality that makes him fall for the spy-game-hating daughter of a former adversary. While Léa Seydoux (“Blue Is the Warmest Color”) is lazily lovely in that role, her character doesn’t seem nearly interesting enough for Bond to regard as life-changingly irresistible. In spite of those lapses, there’s actually plenty to like about “Spectre.” The Day of the Dead opening in Mexico City is terrific, beginning with a wonderfully long continuous shot that follows Bond from a cast-of-thousands parade into a hotel, out a window, over ledges and across rooftops to assume a sniper position. It’s the stylish cinematic opposite of the frantic foot chase that opened “Casino Royale,” but leads to an equally thrilling outcome. Add in a car chase in Rome, a plane-and-SUVs chase in Austria, a beat-the-clock bomb countdown in London and the seduction of Monica Bellucci as a not-so-grieving stiletto-heeled widow, and all your basic Bond needs will be more than met. Andrew Scott (Moriarty in the recent BBC “Sherlock” series) is appropriately obnoxious as Max Denbigh—aka C—the condescending new head of British intelligence. Resembling a creepy Mark Ruffalo, he wants to eliminate the “double-O” program and instigate a new worldwide electronic surveillance network. It’s obvious from frame one that he wants to send the world down the tubes, and not just because the newly merged MI5 and MI6 headquarters skyscraper looks like a toilet seat on top. Ralph Fiennes is back as the new M, whose function this time around is nearly identical to that of Alec Baldwin’s character in the latest “Mission Impossible.” Ben Whishaw’s Q comes up with exactly the kind of fancifully deadly gadgets here that he mocked in “Skyfall,” and also gets out of the office for some laptop-toting field work. Craig has made noises about not wanting to return for another 007 installment, but it would be a shame if his exit occurred quite literally without a bang. “Spectre” isn’t a bad Bond film (certainly nowhere near as disappointing as “Quantum of Solace”), but one that feels more like a placeholder than a properly spectacular sendoff.